American Kenpo (/ˈkɛnpoʊ/, pronounced KeNpo), also known as Kenpo Karate, is an updated system of martial arts based on modern-day street fighting that applies logic and practicality. It is characterized by the use of quick and powerful strikes delivered from all of the body's natural weapons, powered by rapid stance transitions, called "shifting." Beginners are introduced to basic attack responses, which comprise a larger system taught through scripted scenarios, which allow instructors a platform to share concepts and principles Ed Parker emphasized in his teachings. The purpose of training in this manner is to increase physical coordination and continuity with linear and circular motion. Each movement, when correctly executed, leads into the next, keeping an adversary's "dimensional zone" in check, while limiting their ability to retaliate. Should the adversary not react as anticipated, the skilled Kenpo practitioner, it is argued, is able to seamlessly transition into an alternative and appropriate action, drawn spontaneously from the trained subconscious. Founded and codified by Ed Parker, American Kenpo is primarily a self-defense combat system. Parker made significant modifications to the original art of Kenpo which he learned throughout his life, by introducing or changing principles, theories, and concepts of motion, as well as terminology. At the time of his passing in December 1990, Parker had created Short Form 1, Long Form 1, Short Form 2, Long Form 2, Short Form 3, Long Form 3, Long Form 4, Long Form 5 (Surprise Attacks), Long Form 6 (Bare Hands vs. Weapons), Long Form 7 (Twin Clubs), and Long Form 8 (Twin Knives). Parker also created 154 named (ideal phase) technique sequences with 96 extensions, taught in three phases (Ideal, What-if and Formulation Phases). Parker believed in tailoring Kenpo to the individual and would also encourage his students to explore the unknown areas of martial arts. Parker left behind a large following of instructors who honored his teachings by implementing many different versions of American Kenpo. As Senior Grandmaster, Parker did not name a successor to his art, but instead entrusted his senior students to continue his teachings in their own way. The word kenpō is a Japanese translation of the Chinese word "quán fǎ". Its widespread, cross-cultural adaptation has led to many divergent definitions of its exact meaning. The character for Quan means Fist and Fa means Method, Principle or Law. Kenpo is usually understood to mean Fist Law or Fist Method. American Kenpo is often seen written as "American Kempo", leading to some confusion over the term's pronunciation. However, it is pronounced as if they had an "m". Kenpo is an example of romanization, while kempo results either because of straightforward anglicization or as a result of applying Traditional Hepburn romanization, but failing to use a macron to indicate the long vowel. The modern history of American Kenpo began in the 1940s, with James Mitose (1916–1981). Mitose was only one of the many people that Ed Parker's Kenpo Instructor William K. S. Chow worked with. William K. S. Chow, aka Professor Chow, aka Thunderbolt Chow, was already an accomplished practitioner of the Martial Arts and already taught students before joining up with Thomas Young and James Mitose. Professor Chow and Thomas Young handled the teaching of the Martial Arts and James Mitose advertised the club and set up shows where Professor Chow would demonstrate his skill. However, Professor Chow soon realized that James Mitose was, in his own words, "a con-artist who was all talk" and went off to teach on his own. Mitose was never a teacher of Ed Parker, and thus had no part in American Kenpo. William Chow studied multiple Martial Arts in Hawaii, including Chinese Kenpo from his father. Chow eventually developed Kenpo Karate, which had a blend of linear and circular motion, and emphasized practical fighting techniques designed to outperform the various martial arts in the melting pot of Hawaii. Chow experimented and modified his art, adapting it to meet the needs of American students. The legendary Ed Parker, dubbed "The Magician of Motion", started his martial arts training in Judo, earning a black belt. He then studied western boxing from his father, a boxing commissioner in Hawaii, before eventually training and earning a black belt from William Chow in Kenpo Karate. After Ed Parker moved to California, he cross-referenced his martial arts knowledge with Chinese martial arts masters in China. Parker hosted a large martial arts tournament, the Long Beach Internationals, where he used his analytical mind to study the attending martial artists and improved his own system, eventually founding American Kenpo. Ed Parker founded his own Kenpo association, The International Kenpo Karate Association (IKKA), after his students started teaching his art in other countries. Al Tracy claims that Chow promoted Parker to sandan (3rd-degree black belt) in December 1961. Senior Grandmaster Ed Parker called his art American Kenpo. He started teaching other Hawaiian Islanders attending Brigham Young University in Provo, Utah in 1954. By 1956, he was teaching commercially in Provo. Late in 1956, he opened a studio in Pasadena, California. He published a book about his early system in 1960. The book has a heavy Japanese influence, including the use of linear and circular movements, "focused" techniques and jujutsu-style locks, holds, and throws. When Parker increased the Chinese arts content of his system, he began to refer to his art as Chinese Kenpo. Based on this influence, he wrote Secrets of Chinese Karate, published in 1963. The system which came to be known as American Kenpo was developed by Parker as his Specific System, and featured Parker's revisions of older methods to work in more modern fighting scenarios. He heavily restructured American Kenpo's forms and techniques during this period. He moved away from methods that were recognizable from other arts (such as forms that were familiar within Hung Gar) and established a more definitive relationship between forms and the self-defense technique curriculum of American Kenpo. Parker also eschewed esoteric Eastern concepts and sought instead to express the art in terms of Western scientific principles and metaphors. During this time, Parker also dropped most Asian language elements and altered traditions in favor of American English. Ed Parker continually developed his art, causing students to learn different curriculum interpretations and arrangements depending on when they studied with him. 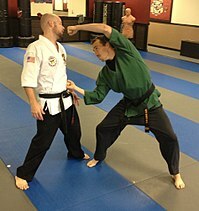 Since many instructors had gone their own ways and didn't continue with Parker's updating, Kenpo today has several different versions of techniques. None of the versions are wrong, as long as they work for the individual practitioner. This is what set Parker apart from many traditionalists who wanted to make students into exact replicas of their instructors. American Kenpo should be tailored to fit each individual student by a competent instructor. While Parker was labeled a rebel when he first introduced his revolutionary ideas, they have since been tested and proven by members of the military, law enforcement, and civilians. Many have successfully survived violent situations due to the training they received in American Kenpo. One of the best-known students of Ed Parker was Elvis Presley. American Kenpo emphasizes lightning fast techniques to destroy an attacker in seconds. Kicks are less common, and usually directed at the lower body because high kicks are slower to execute and potentially compromise the practitioner's balance, higher kicks are taught to more advanced and capable practitioners. American Kenpo contains more kicks than Tae Kwon Do, more punches than Western Boxing, more throws than Judo, more elbow and knee strikes than Muay Thai, more neck cranks and joint dislocations than Jujutsu and Sambo combined, and more knife and stick (club) combat techniques than Silat and Kali combined. The caveat is that no practitioner is expected to know and use it all. The mountain of motion and principles are available, but after learning the basics students specialize in whatever areas fit their needs and desires. A soldier may emphasize knife techniques, a police officer may emphasize locks and stick techniques, a civilian interested in competition may emphasize the less lethal options, while some specialize in the more lethal aspects of the system. Physically, American Kenpo develops environmental awareness, structural stability, balance, coordination, flow, speed, power and timing in that order as the student progresses through a step by step curriculum. Memorization of the system is not necessary to gain functional skill and is primarily for students who wish to become instructors. All American Kenpo students are taught not only how to execute each basic movement in the system, but also when and why to execute each basic movement. Senior Grand Master Ed Parker placed emphasis on concepts and principles over sequences of motion. He did not want his students to mimic him but rather to tailor his American Kenpo system to their own circumstances and needs. Thus American Kenpo is not a traditional art but a combat science that is designed to evolve as the practitioners' understanding improves. This also placed the burden of effectiveness on the individual practitioner. It was up to them to make their American Kenpo applications effective by correctly applying the concepts and principles to the instructor's ideal phase techniques. Students are encouraged to formulate a logical sequence of action that removed the dangers of what-if scenarios, effectively turning a what-if problem to an even-if solution. Every American Kenpo black belt will have their own unique and tailored style, but Parker published minimum requirements for each belt rank that instructors in his association - the IKKA - were to follow. However, if a Kenpo Instructor starts his own association, he or she is free to select his or her student's base curriculum as they see fit. Basic principles, concepts and theories such as "Marriage of Gravity" — settling one's body weight in order to increase striking force, and many others out lined in Parker's Infinite Insights Books (5). Every block is a strike, every strike is a block — a block should be directed and forceful enough to injure an opponent, decreasing their ability to continue an attack. Every strike should counter an opponent's movement, decreasing their ability to mount an attack. Economy of Motion — choose the best available target, choose the best available weapon, choose the best available angle, in the least amount of time, to get the desired result. The design of the International Kenpo Karate Association crest was completed in 1958, as the art of American Kenpo was gaining international notoriety. The crest design was meant to symbolically represent the art's modernized form while simultaneously acknowledging the roots of American Kenpo in traditional Chinese and Japanese martial arts. Represents bravery, power, and physical strength. It is the early stage of a martial artist's training. It is important to work on the basics (e.g., to have a good horse stance) to prepare the body for later advancement. Also, the Tiger in Chinese culture represent the celestial guardian of the West cardinal direction. The yin aspect of individual. Represents quintessence, fluidity, and agility, but also spiritual strength. It is the later stage of a martial artist's training. The dragon is placed above the tiger in the crest to symbolize the importance of mental and spiritual strength over physical strength. This does not mean that physical strength is unimportant. What it does imply is that martial artists need to have a good conscience to guide their physical action. Also, the Dragon in Chinese culture represents the celestial guardian of the East cardinal direction. The yang aspect of individual. The lines within the circle represent the original methods of attack first learned by ancient practitioners of the Chinese martial arts. They also demonstrate the pathways which an object could travel. The colors are representations of proficiency within the art, alluding to the colored belt ranking system. The white represents the beginning stages, black represents expert, and red represents professorship. The writing acknowledges the art's Eastern roots. The characters on the right of the crest translate to "Law of the Fist, "Tang/Chinese Hand （唐手）" or "Empty Hand"（空手）" a.k.a. "Kenpo Karate". The characters on the left translate to "Spirit of the Dragon and the Tiger." The shape of the crest represents the structure of a house. The walls and roof are curved to keep evil from intruding. The ax at the bottom of the crest is a solemn reminder that should a martial artist tarnish the reputation of the organization they will be "cut off" completely. American Kenpo has a graded colored belt system consisting of white, yellow, orange, purple, blue, green, 3rd degree brown, 2nd degree brown, 1st degree brown and 1st through 10th degree black. Different Kenpo organizations and schools may have different belt systems. The black belt ranks are indicated by half-inch red 'tips' up to the 4th degree, then a 5-inch 'block' for 5th. Thereafter, additional half-inch stripes are added up to the 9th degree. For 10th degree black belt, two 5-inch 'blocks' separated by a half-inch space are used. In some styles, an increasing number of stripes on both sides of the belt can indicate black belt ranks. There are different requirements per belt depending on the school. Parker's IKKA schools stayed with the 24 techniques-per-belt syllabus, though some schools today have adopted a 16-20-24 technique syllabus as their standard. The 24 and the 16-20-24 technique syllabuses contain exactly the same techniques, but the latter groups them differently so fewer techniques are found at lower belt levels, and there are more belt levels to be found. In addition to self-defense techniques, Parker set specific criteria required for proficiency at each level. The criteria included basics categorized by stances, blocks, parries, punches, strikes, finger techniques, kicks, and foot maneuvers, as well as the much neglected specialized moves and methods category, which includes joint dislocations, chokes, take-downs, throws and other grappling components. Beyond proficiency, a student's character and attitude can also be analyzed as a major consideration in the promotion to a new rank. Promotion after 3rd degree black belt has more to do with contributions made back to the art, such as teaching or other great works of exploration. For example, a third degree black belt who further explores knife violence and brings that knowledge back may be promoted for his excellent contributions. ^ Franck, Loren (November 1985). "Ed Parker on Bruce Lee, Elvis Presley, Full-Contact Karate and...Ed Parker". Black Belt. pp. 26–31. Retrieved 2015-05-13. ^ Corbett, John R. (July 1979). "Secrets of the Magician of Motion: Ed Parker". Black Belt. pp. 21–27. Retrieved 2015-05-13. ^ Corbett, John R. "Lifting the Veil with Kenpo". Black Belt. pp. 23–27. Retrieved 2015-05-13. ^ a b Robinson, D. L. (November 1990). "10 Kenpo Misconceptions". Black Belt. pp. 34–37. Retrieved 2015-05-13. ^ Barboza, Guido (January 1981). "Has the American Revolution of the Martial Arts Begun? The World's Best". Black Belt. Retrieved 2015-05-13. ^ "Kempo's Tai Chi Connection". Kung Fu Magazine. Retrieved 2010-02-06. ^ Hepburn romanization provides for the use of the letter "m" when ん precedes a labial consonant such as "p". ^ Perkins, Jim (July 2005). "William Chow: The Lost Interview". Black Belt Magazine. Cruz Bay Publishing, Inc. Archived from the original on 2008-02-01. ^ a b Parker, Ed (1982). Infinite Insights into Kenpo, Volume 1: Mental Stimulation. Los Angeles, California: Delsby Publications. ISBN 0-910293-00-7. ^ Wedlake, Lee Jr. (April 1991). "The Life and Times of Ed Parker". Black belt magazine. Cruz Bay Publishing, Inc.
^ a b Tracy, Will (March 8, 1997). "Setting History Right 1954-1956". Kenpo Karate. Retrieved 2014-02-17. ^ Tracy, Will (1999-08-08). "Kenpo Karate Setting History Right - The Blackbelted Mormon". A Brief History of Kenpo. Kenpo Karate. Archived from the original on 19 December 2008. Retrieved 2008-11-08. ^ Tracy, Will (1999-08-08). "Kenpo Karate Setting History Right 1956-1959". A Brief History of Kenpo. Kenpo Karate. Archived from the original on 1 November 2008. Retrieved 2008-11-08. ^ Parker, Ed (1963). Secrets of Chinese Karate. Prentice-Hall. ISBN 0-13-797845-6. ^ Parker, Ed (1975). Ed Parker's Kenpo Karate Accumulative Journal. Pasadena, California: International Kenpo Karate Association. ^ Pollard, Edward; Young, Robert W. (2007). "Kenpo 5.0". Black Belt Magazine. Cruz Bay Publishing, Inc. 45 (1): 76. ^ Parker, Ed (1982). Infinite Insights Into Kenpo vol.1. Los Angeles, California: Delsby Publications. p. 122. ISBN 0-910293-00-7. ^ a b Parker, Ed (1982). Infinite Insights into Kenpo Vol.1. Los Angeles, California: Delsby Publications. p. 122. ISBN 0-910293-00-7. KenpoTech.Net—A site dedicated to the preservation of Ed Parker's American Kenpo Karate. Includes full details on techniques, forms, sets & more.